A lot of the cakes I make for clients in my bakery tend to be more sturdy madeira style cakes, I mean they have to stand up to doweling/stacking and a whole host of decorations so the style of cake has to be more robust, tasty and have a decent shelf life. This means that when I get to bake for the family, I like to go all out and make the gooey and softest cakes imaginable. American cakes are very different from English cakes and when it comes to chocolate cake I always stick with my favourite - my Mum's recipe. It is a slight variation on the ever popular Hersheys recipe but with less sugar and more....oomph! I've never made peanut butter ganache before so I did a few trials and found a recipe that makes a very soft chocolate ganache that has a hint of peanut butter flavour to it. I'll try it again using white chocolate as I think this'll yield a stronger flavour but either way I'll report back soon. 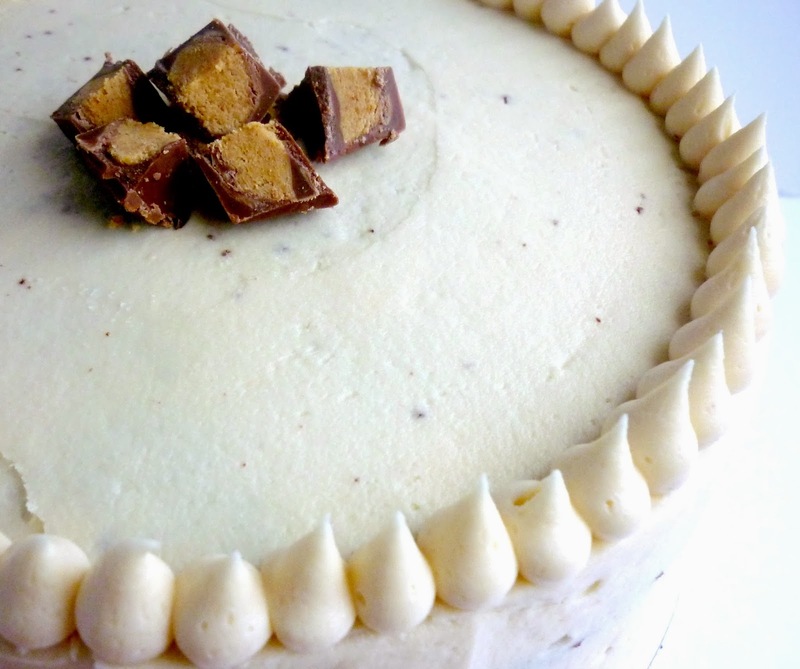 But the winner in this recipe was the marshmallow buttercream frosting. 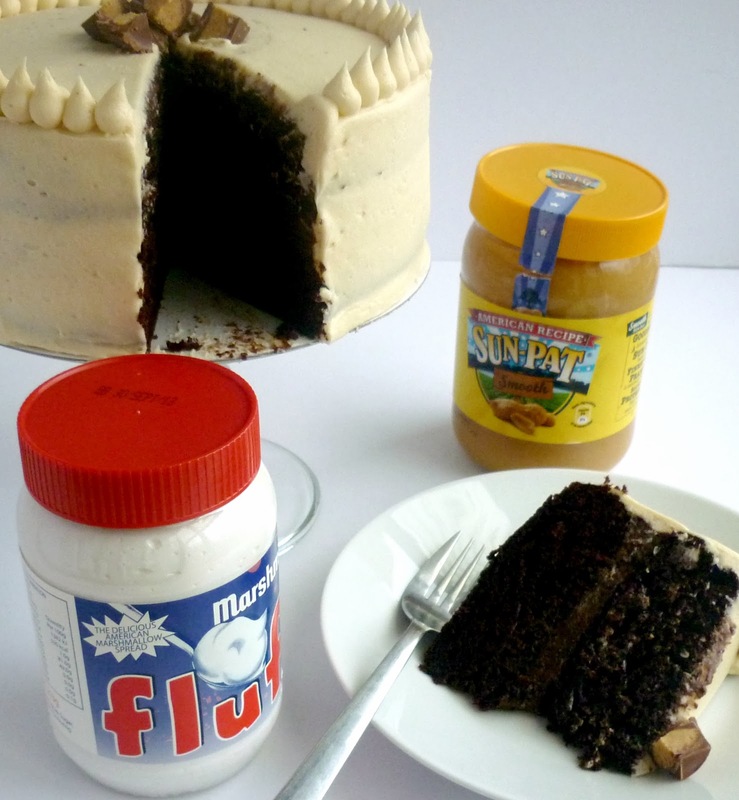 I've made marshmallow style frosting from scratch before but I had a few jars of marshmallow Fluff to use up and everyone knows chocolate, peanut butter and marshmallow was a winning combination so what choice did I have? I made enough frosting to thinly cover an 8" round cake and it was just enough sweetness alongside the rest of the cake. 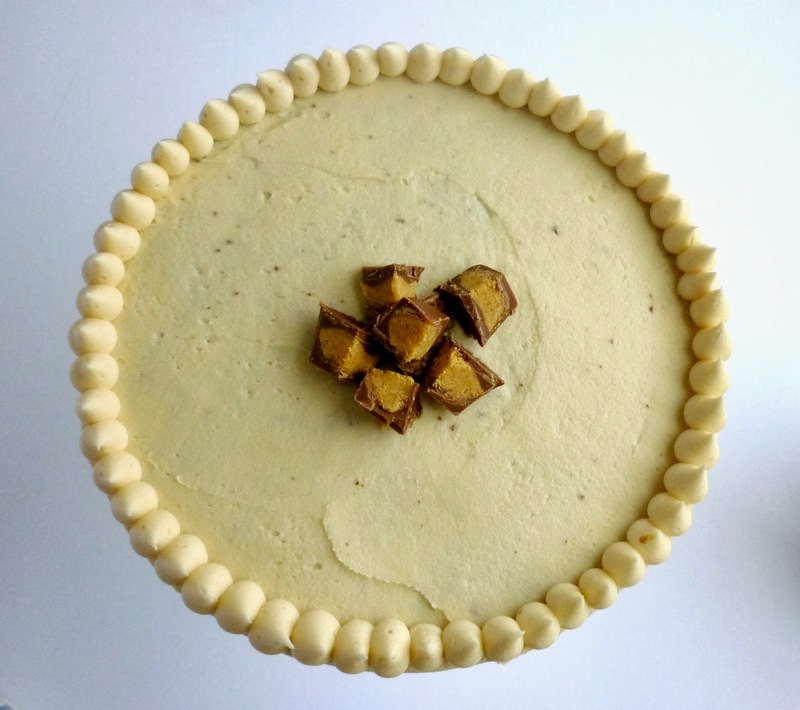 This cake stays moist for DAYS and I store it in an airtight container to keep it fresh. 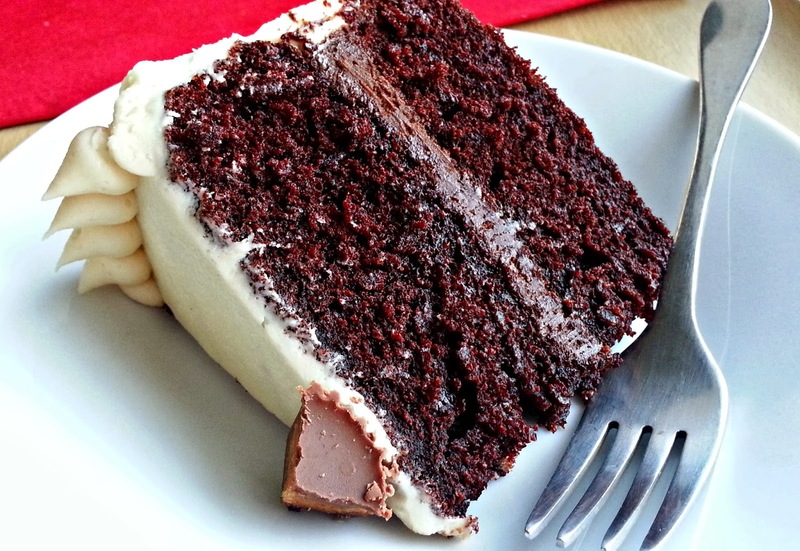 The cake itself has a lovely deep chocolate flavour, which is helped along with the addition of a little coffee in the mix, and it's not tooooo sweet which I find off putting in a chocolate cake. Even if you don't have time to make this whole recipe I URGE you to try this cake. It's a winner on my house and birthdays just wouldn't be the same without it! Preheat oven to 350f/180C/160C in a fan oven. Grease and line 2 x 8" round cake tins and set aside. Stir together flour, sugar, cocoa, baking powder, bicarb, espresso powder and salt until mixed. Add eggs, milk, oil and vanilla and mix for 2mins on a low speed. Slowly stir in boiling water. Don't panic, the batter WILL be very thin and that's OK! Pour into tins and bake for approx 30mins or until a toothpick inserted in the centre of the cakes comes out clean. Make ganache: add chopped chocolate and peanut butter to a medium bowl. Bring cream to the boil in a saucepan and once it hits boiling point pour over chocolate and cream mixture. Leave for 5mins before stirring to ensure all chocolate is melted. Leave at room temp until firm enough to spread onto cake (you can pop it in the fridge for 15-30mins and this should speed things up). Make frosting: Cream the butter and fluff in a mixer until light and fluffy (approx 5mins). Slowly add icing sugar and vanilla extract and beat for a further 2-3mins. If the mix is a little stiff then add a few drops of milk but it should be creamy enough to pipe and hold it's shape. Allow to cool in tins for 10mins and then remove and cool completely on a cooling rack. Fill cakes with ganache and then coat with frosting. P.S. 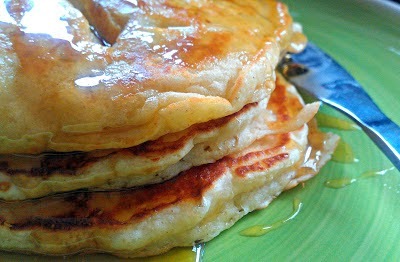 Are you celebrating Shrove Tuesday (Pancake Day) today? I'll be making my favourite fluffy American pancakes for me and the boys - the mix in options are endless but I ALWAYS opt for heaps and butter and syrup...yummy! Check out my recipe by clicking the link above! Liana, this looks completely over the top amazing...that cake looks so moist and the frostings so delish, how I would love a big slice right now!! Mmm I like that sound of the chocolate cake, I am always looking for a good chocolate cake so may give this one a whirl!